On Saturday afternoon Rachel went into campus with Andrew (one of her favourite things to do) while I stayed home and put up Christmas lights (and trimmed the hedges and cleaned out the gutters). Miriam thought about going into campus as well (only the children well-behaved enough to sit quietly and read on their own without bugging him are allowed to go, which means Benjamin and Zoë have never been invited to chill in Daddy's office...ever) but the idea of stringing up Christmas lights with me was also pretty appealing. In the end she picked me! 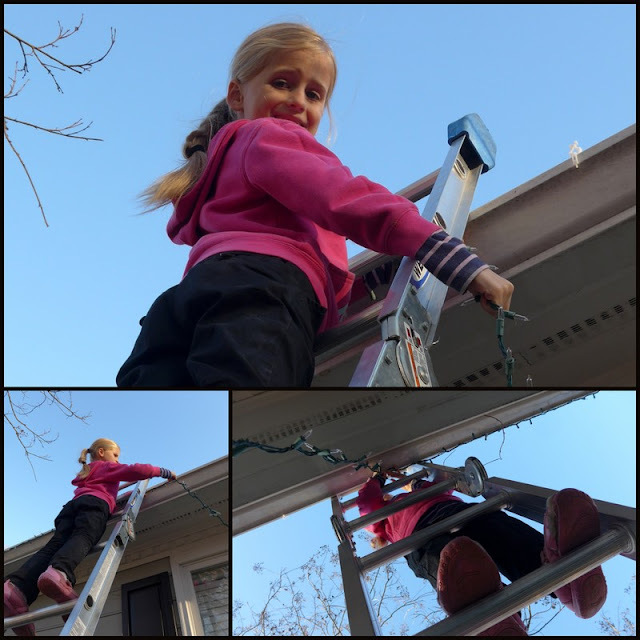 Mostly she played with the neighbours, if we're being honest, but she did make it up the ladder a time or two and was a big help fetching things for me ("Garden gloves!" "Another clip here!" "Oh! Oh! Baby on the road!") while I was stuck up the ladder. On Friday morning the kids and I set up the tree while Andrew and Zoë were out grocery shopping (and then set up the radio in the new van). The kids had a lot of fun (and fights) decorating it. I always have a Hallmark vision of decorating the Christmas tree with the whole family while carols play quietly in the background and a fire crackles in the fireplace, while we pass around ornaments and talk about memories of Christmases past. Usually there's a tray of cookies in there, too. You know, that I had the foresight and inclination to bake in preparation for the glorious tree-trimming tradition. Yeah, so far that has yet to happen. What does happen is a little bickering, a few broken ornaments, children filtering in and out, Mom losing her cool and snapping at a kid or two, fake pine needles all over the floor, and then a crazed lunch break somehow leading to animal crackers being ground into the carpet. So it's not Hallmark, but I think the kids had fun. Maybe one year we'll break out the lovely glass baubles we got in Egypt without worrying about who was going to knock the tree over this time (they've never left the box we packed them in when we purchased them...in 2009) and someone (probably not me—but this is why I had children) will think to make some holiday cookies and we'll all gather around the tree calmly put up every decoration without anyone biting anyone else. Here's Zoë thinking, "These crazy people dragged a tree into the house!? Today's going to be a great day!" Benjamin loved every ornament, he thought every picture of Andrew was a picture of him, he woke up in the morning and ran into our room nattering on and on about "l'ornaments!" "Are we going to put up le Christmas tree today?" he asked, substituting /l/ for /th/, as one does. "I want to get out all l'ornaments! What about le star? Can I put le star on le top of le Christmas tree?" He did get to put that star on top, and he was so excited to do it but he was equally excited over every single ornament he pulled out. And here's Benjamin saying, "Huh. I didn't know Santa had an airplane..."
In the first half hour after we finished decorating the tree I think Zoë snapped the string on...fifteen ornaments? That's probably a low guess (I have them all and I guess I could count them, but I have better thins to do...like the dishes). It was like once she found the kind she could snap (the thin gold strands) she went around the tree and systematically yanked off every single one she could reach. Besides that (and having "Do not touch the Christmas tree!" on repeat) we haven't had any serious casualties in the ornament department...but that's probably only because there's nothing truly breakable on the tree! Benjamin seems like a good candidate for learning French! One year (my parents told us) they were in the kitchen when they heard a loud crash. They ran into the living room where the Christmas tree laid all over the room. There we were (my 4 brothers and me, I was probably Zoë's age, but eager to climb and jump off anything taller than me) standing as innocent as we could saying "we don't know how it happened, it just fell over by it's self". The tree was placed in a 5 gallon bucket of sand and tied to the curtain rod, but even that wasn't enough to hold 5 little boys trying to climbing trees. Isn't that what trees are for? You have a really cute family! I love the pictures so much. And the writing, too!